Free Shipping Included! Giant Art Apex Huge Modern Abstract Giclee canvas Print for Office Home Wall Decor with Stretcher, 72 X 72'''' by Giant Art at When Art Imitates Life. MPN: GWA17667. Hurry! Limited time offer. Offer valid only while supplies last. Cj Anderson is an abstract painter based in Denver, Colorado. She started her career in interior design and has worked in the field of architecture. Cj Anderson is an abstract painter based in Denver, Colorado. She started her career in interior design and has worked in the field of architecture. 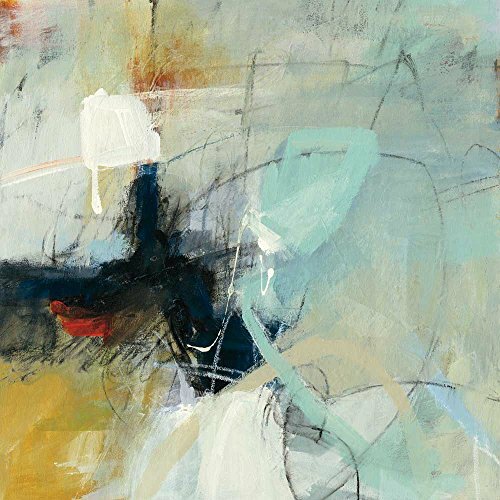 Her abstract Impressionist paintings delve into composition, juxtaposition of form, and color. They are about passion, purposeful brushwork, and movement of paint and line across the canvas. Each piece begins with a bright color palette influenced by Western light. Layers of neutrals, washes, and gestural marks are added until only hints of the original conception remain. This high end Giant Art giclee will give your home an instant stylish upgrade and create stunning focal point that allows the rest of your room to shine. Finally our revolutionary DIY Giant canvas stretching system allows you to own prints larger than all current standard offers combined. The impossible is made possible with this unique and very easy DIY Giant canvas art stretcher. One large bold piece of art is all you need to instantly set a elegant mood in all your room decor. Perfect for residential commercial and office decoration. Your large scale giclee is only made in America from the highest quality eco-friendly materials for crisp, well defined, luxurious reproductions. You will get endless compliments with this upscale extra large gallery archival quality print. A real show stopper. If you have any questions about this product by Giant Art, contact us by completing and submitting the form below. If you are looking for a specif part number, please include it with your message.